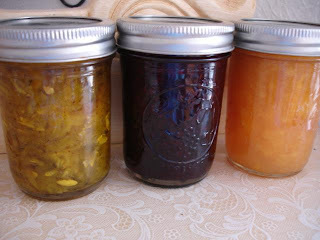 Preserves: cucumber relish, blackberry syrup, peach preserves. Remember how the women of the past were able to come home from church and serve a big meal to company? I used to wonder how in the world they managed it, and why it seemed so difficult for the modern homemaker, who has so little time. This question was answered during gardening: they had convenience foods, which they preserved from their gardens. While it was quite an intense operation to do this during certain times of the summer, they only had to do it that one time, and there would be convenience foods for the rest of the year. Potatoes could be put up in jars, and later just opened, poured into a pan, and heated. Other foods, like plums and grapes, could be dried, and later put into pies. When the freezer was developed, people learned to pre-bake pie crusts and breads, for the winter. They could also freeze the green beans and brocoli that they blanched and put into freezer containers. This was their fast-food. It was hard work, but the whole family, even the men and boys, participated in some ways. Grandmothers were engaged to take care of little ones and keep them from being underfoot in the kitchen, and sisters and aunts could help with cleaning and laundry and meal times. Fishing was a big deal in the old days, too. Our parents preserved fish by creating a method of letting smoke preserve it, or canning it in a special canning set. This was an intense job but yet the time seemed leisurely. These people liked doing it and I suppose the happiness they felt at knowing that they were providing their own foods, made up for the time-consuming effort. Preserving the home is very hard work and requires that a woman go over her territory regularly, checking attiudes and reminding the family members of their duties and their beliefs. It means that they watch out for influences that would cause disharmo ny, disorderliness and disloyalty. It means they watch the moods of their children and correct errant thinking. Contrary to popular belief, we are supposed to control the home. We are to guard it, and direct it. Like preserving food, it takes some intense moments, but if we are alert and send out reminders, both by what we say and what we do, we can come closer to preserving the family and home life. There are other things, that though material in nature, contribute to preserving the home. One is cleanliness and another is doing things at the time they need to be doing. Letting something "go" can only make it worse, so when something has to be looked after, is the time to do it. When preserving food, it has to be processed just before it gets too ripe, and should be canned or frozen or dried the day it is picked. Each day that goes by, and the riper it gets, the more likely it will lose its goodness and attract bacteria. In preserving the home, we have to take responsibility to see that the home is guarded and guided. It does not mean that the woman has to do every single thing herself, but that she sees that it gets done. 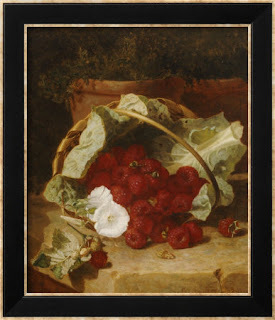 I did not sew a special dress or apron for food preparations of harvest (canning, freezing, drying, collecting), but I did learn what was needed: clothes that were cool, and aprons that looked like the berries or tomatoes, that would hide stains for a while. Preserving the home means also that we cling to certain beliefs about marriage, parents, children and others, even though the prevailing culture wants to interfere. It means we do not listen to everything around us that tries to crack our system. It means that we do not fear to guard our marriages and our children, even when others try to break down our beliefs with the temptations of money or things or temporary happiness. The produce from the garden has to be treated carefully, kept clean and pure, and preserved to be eaten when it is needed. Putting time into the preservation of your home life will pay dividends later. It might not be easy to establish your freedom to be a home guard and home guide, but the effort will pay off, if you do not give up. There is surely a lot more to preserving the home, and I am sure others can contribute some things I have not even thought of, to this discussion. 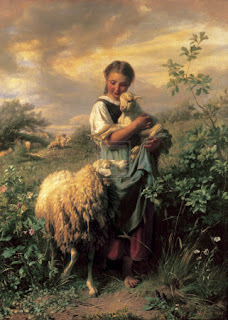 Check out other paintings by this 19th century artist, at allposters and other art sites online. 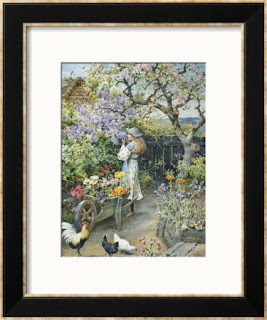 This red rose cotton print has the lovely light green or "sage" background that reflects the colors of the vegetable garden. The color bar on the edge of the fabric is great to use on a card in your purse, whether you are using it for home decor or clothing. Take it with you whe you want to match up your colors to other things. 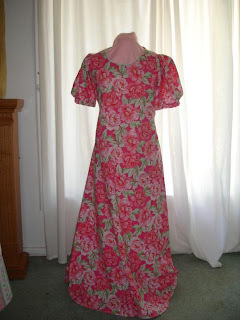 ( This is a "garden dress" which will be photographed later.) The print comes in other combinations, including a peach colored back ground with co-ordinating roses, a pink back ground and a beige back ground. Check it out at Joannes. It might be in the "Quilters Showcase" collection. The colors in this garment look a lot like the salad ingredients from the garden, so I call it "Salad Dressing." 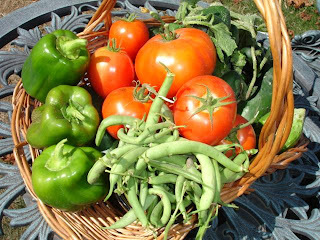 A bountiful basket with a late crop of salad vegetables. Even the red and green peppers (capsicum) are works of art. 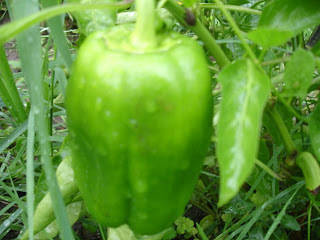 From the lower end: parsley, green pepper, cucumber and tomato. In regard to my previous article on overcoming discouragement, someone requested that I post a reminder about good nutrition and proper rest. I am glad to be reminded of this, because indeed, things usually seem bleaker as evening progresses, and problems loom larger. In the morning, people's burdens are lighter and the weight of the day is not upon them. If they do not get enough sleep throughout the week, life seems more discouraging. There is a saying that life is better after a good nap! Food without additives, particularly sodiums, just make the mind clearer, and good pure water without additives, can make people think better. 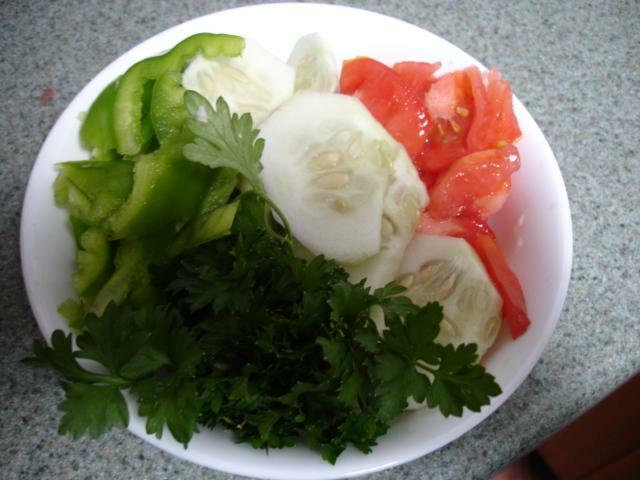 If you grow just one vegetable in a pot, you will notice the taste is different and it is loaded with the nutrients it is supposed to have. If you begin growing vegetables one at a time, you will not be overwhelmed with work, and it will help teach your children to grow food and be able to look after themselves. 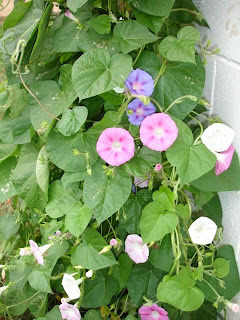 If you have no children, and grow something, even a potato or string beans, you can share it with others. To make your own salad dressing, mash an avocado with a fresh tomato and add a crushed or shredded cucumber, and any seasonings you like, from your herb garden. 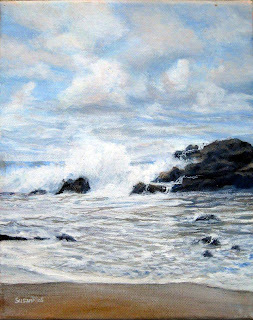 This is a new painting by Susan Rios and can be purchased online, called "The Ocean as Lace." There are a lot of other people who think in terms of fabric, when they look at the world around them. The foam on top of blue water, does look like lace. 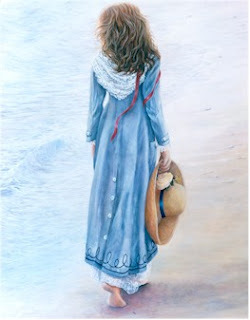 "A Familiar Walk" is an older painting by Susan Rios. This blue dress is a perfect compliment to the surroundings, with the lace collar looking just like the ocean's white lacy foam on the blue water. The paintings can be viewed at Susan Rios Editions. This is one of my winter dresses, made from a cotton that looks like linen. 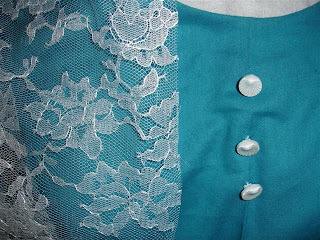 When a lace scarf or collar is added, it has a similar look to "The ocean as Lace". This soft cotton dress is one of the most comfortable things I have to wear when the weather is too cool for short sleeves. There are two shades of teal : one has a blue tone, and the other, a green tone. This one is blue. 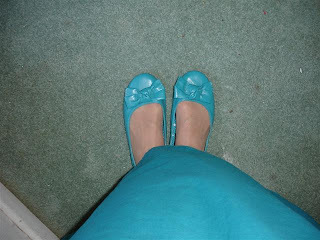 These are the five dollar flats at WalMart that I will be buying for my modest fashion show. They look a lot like the shoes in the 18th century paintings of women, including one of the paintings included in this "Painting Inspired Clothing" series: Eugene De Blass paintings show similar shoes. If you want these shoes, you need to buy a half or whole size larger than your regular size. 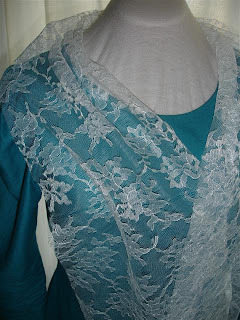 Just buy 1/4 yard of lace fabric, to make a scarf. This really looks like the foam against the ocean, as in the Susan Rios painting I showed, above. Scarves provide a little more modesty, and I will try to also include a post on scarves as jewelry. I don't wear them at home, but they are a nice touch in the public, when you want a little more barrier between you and other people. Scarves are great if you do not have the time or money to invest in making new clothes, or buying new, modest clothes. Just use scarves over your other clothes, and make them more modest. That is one of the advantages of the Indian saree, which can wrap around the body and provide a little more coverage, without adding to heavy a layer of fabric. Scarves are also very, very feminine. 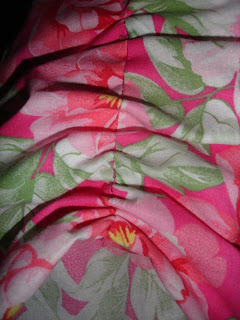 This picture just shows the added seashell buttons, making it a garment with a seaside theme. 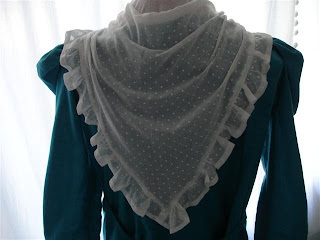 This is the little triangle scarf I made that is sheer cotton, for a removeable collar. 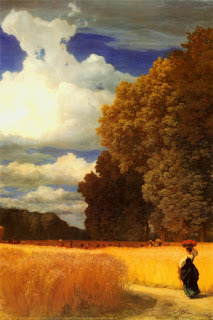 Similar ones can be seen on some of the paintings of the 18th and 19th centuries. 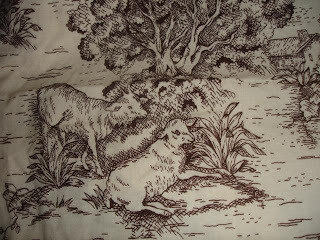 Do not overlook the nursery prints at your fabric stores. One hundred percent cotton, these are soft and very sewable for adult clothing. The children love to look at skirts of their mothers and grandmothers, as they sit and read to them. 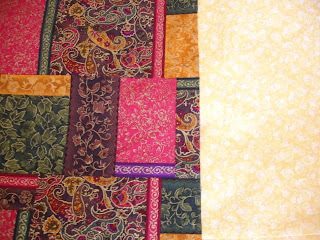 This one is a mock-patchwork piece, which is quite expensive, so I got only a strip of it to add as a border to a dress. The fabric of roses you see on the left, was very affordable, at less than two dollars a yard, so I got enough for dresses for adults and children. The nursery print on the right, has all kinds of co-ordinating fabrics, such as the stripes and the calico prints. If you can see it, there is a strip on the edge of the fabric, there in the middle, which contains dots of color. I call this the color bar, and I use it to match fabrics that I want to coordinate with the main piece. Just clip it and put it in your purse, along with a snip of the main print, and take it when you are shopping for other things, like home decor, or shoes or hair clips, or whatever it is you need to match. That color bar contains all the colors that it took to make that particular print. and a cute little fellow hiding behind the bush. 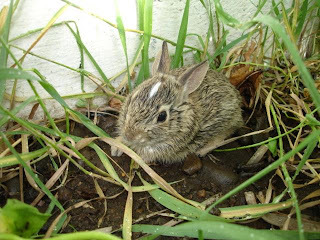 I have been told by dedicated vegetable gardeners that these creatures are not "cute" if you are trying to grow food for your family and they are eating it up. We left an outside row of string beans for them and they never bothered the main garden. I guess they were too full. He just sat there so still ad let me take his picture. When Sam Walton created the first Wal-Marts, he did it for the country people so they would not have to drive a long way to get a pair of shoes, a toothbrush and a hammer or a package washcloths. He wanted to be able to get it all from the same store. He began his first small stores in country areas, and they were a big success, and included fabrics and patterns and notions. From these profits he built even more stores in more country areas. The country people made his stores successful. His profits attracted the larger cities and his stores were soon established in those places, too, but it was built on the loyalty and business of the country folks who shopped those smaller Wal-Marts. Now it only stands to reason that if someone is going to make a curtain, she will then buy a curtain rod on the way out of the store. If she is going to make a dress, she may stop by the shoe department and get a pair of matching shoes. If she is going to sew a bathroom ensemble,, she will stop by the bathroom accessories and pick up some matching towels. By the way, the color families in WalMart all seem to cooridinate--from the candles to the lampshades to the rugs. So, a seamstress will want other things in the same store. Or, she may just notice there is a can of peanuts or a jar of olive oil on sale, on her way up to the cash register, and buy that, too. So, Wal Mart stands to profit by keeping its fabric. Just the other day I was talking to one of the men that cuts the fabric in my area at a Wal Mart. He said that I would not believe how many people came all across the nation from the furtherest coast, to buy fabric. He had spent the morning cutting 10 yard pieces for a woman from Dallas, Texas, and 7 yard pieces for a woman in New Orleans. I think if WalMart execs pay attention, they will find there is a tremendous surge in fabric sales at their left-coast stores, but it is ridiculous that these people are so deprived of their local fabric stores. I have friends in tiny country towns in Texas and Oklahoma who say it is not as much pleasure to shop at WalMart since they took away their fabric department. They now have to drive 30 or 40 miles to a fabric store, and cannot buy tea or flour in the same store, or toothpaste. So, they shot themselves in the foot when they did this. It was these people who built the WalMart success, and now these people for whom Sam Walton built WalMart stores, are again left trying to find a hammer and a hairbrush and fabric by travellling 30 miles. His descendents that have taken over the stores, need to understand people. I know it is a business, and it is about money, but if you care about people, your business will be assured. Wal-Mart, please bring back your fabric department. I recommend this book: "Sam Walton, Made in America--My Story" by Sam Walton. "Competition is good for business. "Why do I drive a pick-up truck? How am I supposed to haul my dogs in a Rolls-Royce?
" Family...must believe in the bedrock values of hard work, honesty, neighborliness and thrift." Discouragement: that which destroys or abates courage; the act of deterring from an undertaking. Discouragement is a natural part of life, but how in the world can it be used? Some people look at life as a story unfolding, and when discouragement comes along, they are rather amused by it. They use it is part of their story. They view it as a challenge, or an obstacle that they have to find a way to remove. 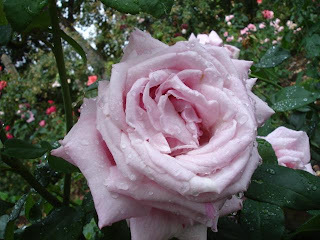 Other people are bewildered by discouragement, feel trapped, and do not know what to do with it. Creating a beautiful spot in the home helps you recover from discourgement. hole that is dug: one to grow, one to get eaten by pests, and a third one to die. We did this with our string beans, tomatoes, green peppers, lettuce and corn, but this year ALL of them grew into perfect vegetables. Having several interests in your life, from sewing, to reading, or entertaining, can prevent the spoilers from taking away your enthusiasm, and discouraging you. 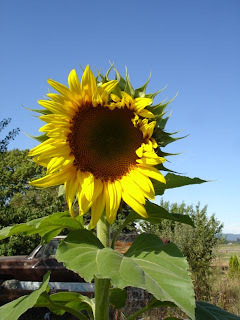 The first few times we planted a garden, nothing much happened and we were not at all impressed by it. Then someone told us that the first year, a garden sleeps. The second year, it creeps, and the third year, it leaps. 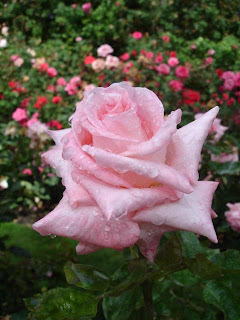 Each time it is planted, the soil is built up a little more and nutrients are added. Then, there is manure. Manure is unpleasant, but it enriches soil when it is worked into the dirt and allowed some time to develop and provide important nutrients. The farmer has to decide what kind of manure it is. Some manure is just straight from the animal, but other manure is mixed with straw or hay or wood shavings from the pen where it sleeps. 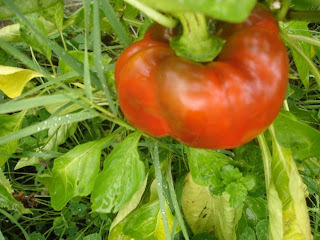 That alters the properties of the manure and determines how much should be put in the garden soil. Taking time to set a pretty table is good way to keep discouragement away. Sometimes homemakers are attacked by people around them who want to discourage them. 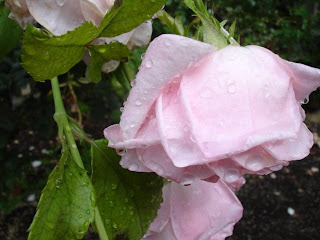 The first year at home, it might not look like there is much going on, because, like the garden, it takes a while to develop the routine and establish yourself. The second year, things may be a little more noticeable, as you have made a little more progress in the things that matter to you at home. The following years, your homemaking has developed a foundation and a routine that your family has gotten accustomed to. Your steady adherance to your duties is showing results. Discouragers are blind to the truth around them. They can see no purpose in your responsibilities at home, and cannot even see obvious results, such as a clean home, good smells coming from the kitchen, an atmosphere of peace, and a beautifully arranged home. The discourager is listening to voices outside the home that say homemaking is not worthwhile. They begin to doubt that your life as a homemaker and caregiver has any value. Discouragers often have a pre-conceived idea of what homemaking is all about, and expect perfection. They are often intolerant to dishes piled in the sink or laundry not finished, and they will not understand the many interruptions in the life of the homemaker. Sometimes jealousy is at the root of remarks aimed to discourage you. Sometimes the love of money is the root of the discouraging comments. Other times, peer-pleasing is the motivation. You have stopped following the trends of the prevailing culture, and it makes other people uncomfortable. Or, someone may be genuinely afraid that you will lose every material belonging and end up wandering alone with no food, no friends, and no fruits of your labors at home. Discouragement can also come in the form of failed tasks or having your work ruined by others. This is one of the reasons I often refer to the description in Proverbs of the little creatures called the ant, the spider and the cony. They do not need an overseer or a ruler over them because they have been given direction by their king, the Lord God, who made heaven and earth. 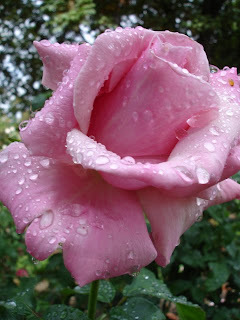 When discouragement comes,in the form of a rain storm or a strong wind, they start over, and rebuild. Whatever the reason for discouragement, it might be a good idea to treat it the same way as manure, and put it to good use. The way to use discouragement is to use it as a signal to do something productive, or reward yourself. If you have just been with someone who has discouraged you, use it as a signal to improve your house in some way. 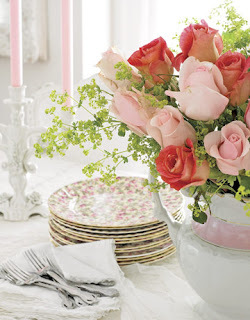 Put a new vase of roses on your table. Light a scented candle. Treat yourself to something you like. Take the children on an outing to look at beautiful houses. Take a basket of gifts to a widow or a lonely person. Make a package for someone. Watch a favorite movie. Clean one room in the house. 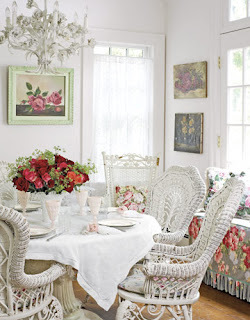 Clean out your china cabinet and organize your tea cups according to color. Bake a cake. Arrange your children's clothes according to season or color. Dress up. The list does not seem to end, when you are trying to list good things you can do to respond to the discouragement all around you. While the other people are wagging their heads and mouthing off, you can create a beautiful guest room and take some pictures for family album. All these ideas are things that show the fruits of your labors. 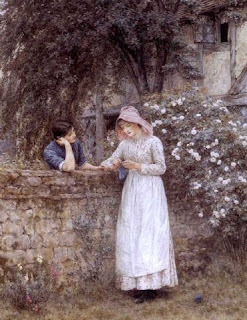 "Give her the fruits of her hands," says the Proverbs, referring to the worthy woman. Even when discouragement is thrown at you, keep doing good. If you are defeated, you are of no use to yourself or anyone. You cannot use your talents or abilities. This is what you were made for: to glorify God and serve Him. If you allow discouragement in your life, it will defeat you in doing what is right. Those who fasted were taught by Jesus not to go around with long faces, making everyone around them miserable because they were enduring the hardship of fasting. Instead, they were told to wash and dress in good clothes and be cheerful. Discouragment is a lot like fasting, because it can keep you from enjoying your normal life. Dressing up and starting anew can make a big difference in the way discouragement affects you. You can use discouragement to create something good, if you will use it as a reminder to do something good. It does not have to be "productive," but it helps if it is pleasant. 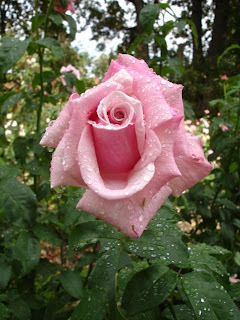 Just do something pleasant, to counter-act any discouragement. The things others tell you can be just ridiculous, so look at it like the manure that it is, and get on with your life. You can briefly explain your convictions to a discourager, and if you can see that they want to take you into a long argument, refer back to your original statement and go about your business. It will take discouragers awhile to understand that being a home maker is partly duty and partly belief. Belief, the Bible says, must be accommpanied by example. Example brings results, talking does not. Use discourgement as a building block to something greater. If someone is constantly worrying you because you are a homemaker, use your computer to write a printable paper about your beliefs. You can hand it to them instead of wearing out your voice and raising your blood pressure. You could also invite the doubter on a tour of your work at home and say something like, "This is the kitchen, and today, I will have to wash all those dishes and fix x number of meals. " Open the refrigerator and point out that you have to shop for food, and will also be cleaning the refrigerator first. Take them to the laundry room and show them what has to be done there. Show them the pile of papers that need to be sorted. Take them to the bathroom and describe what cleaning needs to be done. Show them the appointments on your calender.Take them outside and show them the work that needs to be done there. Perhaps you could make a special list of things you would like to do or make, and when discouragement seems the most unbearable, do one of those things. Write the list in a beautiful blank book and use a special pen. Open the beautiful book when your friends have forsaken you or have discouraged you. David revealed the discouragers in his life, when he wrote the 35th Psalm. He called them "hypocritical mockers," and said they would be brought to shame. Each time someone was discouraged, God gave them something to do. Look at Joshua, Moses, Elijah, Nehemiah, and other great people of the Bible who were discouraged. God reminded them of the job they had to do. Think of any person you know of, past or present, who overcame discouragemet and accomplished something, and immitate their example in courage. There are many reasons for discouragement. I have mentioned one here. 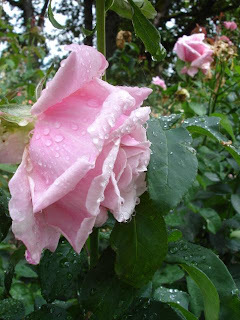 When discouragement is dished up to you, consider it manure, which is useful for growth, if put to work. Use every discouraging comment or action as a signal to produce something of value or do something that has meaning in your life. The discouragers will see you blossom like a flower right before their eyes, as they keep shovelling more manure around you. is fresh and new. 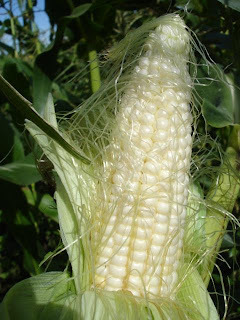 This is sweet corn, which is delicious with garlic or butter. The colors gave me the idea for fabric to make an autumn dress. Can you imagine a green this color with a pale yellow, almost a white, combined to make a dress and jacket or an over-dress and underdress.. everything around me this time of year is dressed up in God's beautiful clothing. How much more should we compliment that beautiful creation. 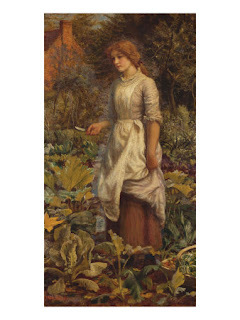 When in a garden early in the morning, the flowers and vegetables appear at their best, their crispest, their shiniest. There is rarely any noise, except the first chirping of a robin or the voice of the dove. I found this fabric at WalMart. 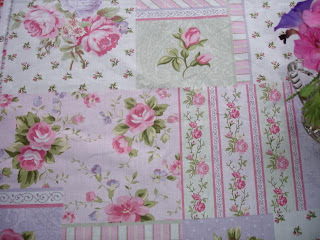 It has coordinating stripe and quilted fabrics. The piece on the right is a dollar a yard. Both are all cotton. 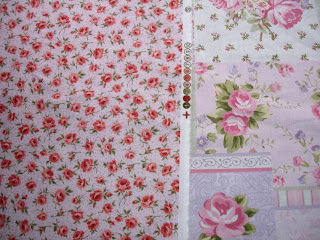 In a while, I will post a sketch of the dress I am going to make, with these two pieces of fabrics, and include a photo of the $5.00 shoes that match the fabric. Since the patchwork pattern on the right (which is also glitterized), is expensive, I will just be using half a yard or one yard of it for parts of the dress, while the golden yellow that has curliques of burgundy in it, will be used for the major part of the dress. 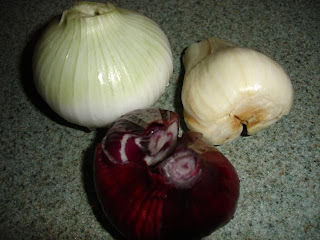 The lower onion has the beautiful berrry color that is in the vibrant fabric, above. I have been invited to have a fashion show and explain about beauty and modesty in clothing for women. This will take place in early October, so I am busy getting the invitations composed, and the material ready to present. I will post everything on the blog. Since the little flats at WalMart have gone down to $5.00 a pair, I will buy a pair for each of the 5 participants in my fashion show, to match the garment I make for them, which will just be one of the easy patterns I am using. 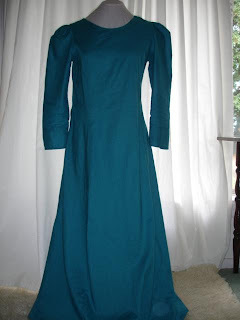 I am doing this not because I recommend everyone sew like this or use that particular style, but because it is expedient for the time that I have available. I'm just trying to inspire women to dress for the wonderful creation around them and be inspired by nature and other things around them: the pretty blue sky, a field of wheat shimmering in the dusk, or a bowl of shiny "Pink-Lady" apples from the market. Have a look of the paintings of the previous centuries, before women wore pants and dressed like men. 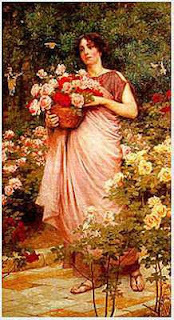 They showed women in beautiful clothes that were actually quite plain, but were shown complimented by matching flowers or gardens. A clearer photograph of the dress on a dress form will be posted soon. Please click on the roses for a larger view of the rain drops. Click on the artist ame to read more about him. If you will notice the photographs and the paintings of the peasants of the previous centuries, the clothing was not colorful. There has been some discussion on this blog about today's dull colors marketed to women, in the form of browns and grays and mudied greens that look like army uniforms. 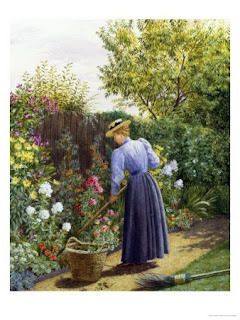 The garden clothing of the past had all those "dull" colors--black, brown, faded, etc, yet, you can tell it had a different affect. What was the difference? The length, and the folds in the skirts, created a more graceful look for women. 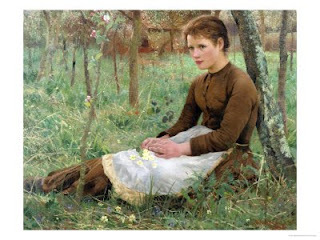 The painters were certainly inspired by the look of a woman, surrounded by beautiful scenery, to capture the memory. I dont know if the clothing of today can inspire this kind of art. Yet, these fabrics were not bright colors and were not of any kind of beauty. It is the drape, and the length, that makes even the darker colors (black, brown,) womanly and feminine. 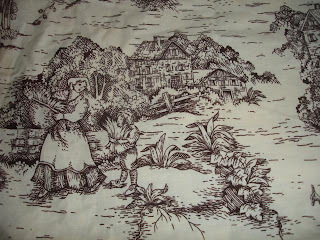 One of the scenes on the cotton toile. Here it is in brown. 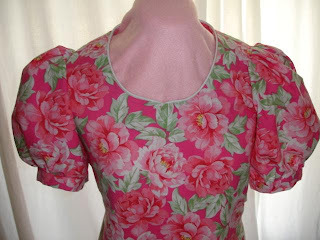 I'll use this piece for a long apron that will protect the bodice and skirt. 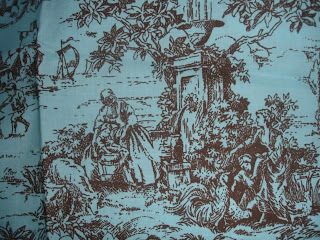 Another scene from the brown toile. 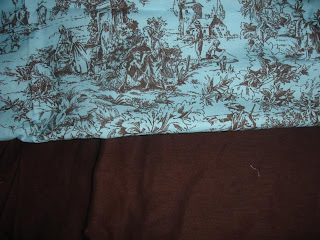 An over dress or "jumper" would be nice in this fabric, or it could be used to go with the brown skirt, and worn to work in the garden. 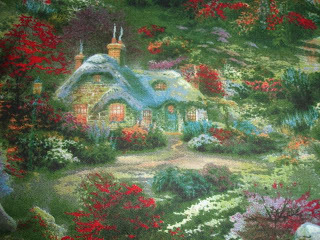 This is the new Thomas Kinkade fabric at Wal Mart. 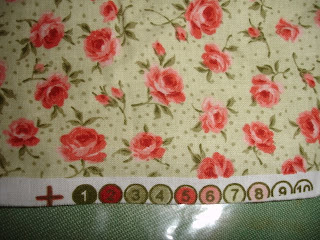 It is expensive so I bought only a yard, to make an apron, and add some color to the brown dress I will be making. It is the longer length of any garment that gives it a soft and flowing look. You can take the same colors and prints, and put it in the shorter and tighter styles and it will not have the same effect at all. 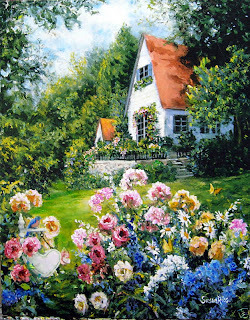 If you will click on the link below and then click on the painting for a larger view, it will show the fabric more closely. 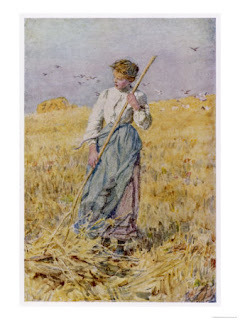 The blue apron/skirt that she is wearing on the top of her skirt, looks as though it could be our modern day blue denim fabric, but what a difference it makes to the total appearance and demeanor of a woman when the fabric is loose and flowing and folded in a way that is different than a man's garment. The whole point of some of these "Painting-inspired dressing" posts is to emphasize that women should look different than men in their clothing. Someone comment before, that the pants were worn under the skirts, and never would a woman wear them as outerwear. What was underwear a hundred years ago, is now outerwear.